All Web addresses mentioned were functional as of 11-23-15. From the Cumberland Gap to the Atlantic Ocean, this is Virginia Water Radio for the week of November 30, 2015. This week, music by the Harrisonburg, Va.-based band, The Steel Wheels, opens our annual episode on winter preparedness. Have a listen for about 35 more seconds. In 2015, winter comes to Virginia—astronomically—on December 21, ready or not. So Virginia’s official Winter Preparedness Week runs this year from November 29 to December 5. Here are some tips from the Virginia Department of Emergency Management for staying safe from winter’s hazardous roads, power outages, and fire hazards. *Try to get to travel destinations before the weather gets bad. You can get road conditions from the Virginia 511 telephone system, Web site, or smartphone app. More information on preparing for severe winter weather and other emergencies is available online at ReadyVirginia.gov. Thanks to The Steel Wheels for permission to use this week’s music, and as we close with a bit more of “Winter is Coming,” here’s hoping that you keep warm and safe during whatever the coming winter brings. “Winter is Coming,” from the 2015 album “We’ve Got a Fire,” is copyright by The Steel Wheels, used with permission. More information about The Steel Wheels is available online at http://www.thesteelwheels.com/. 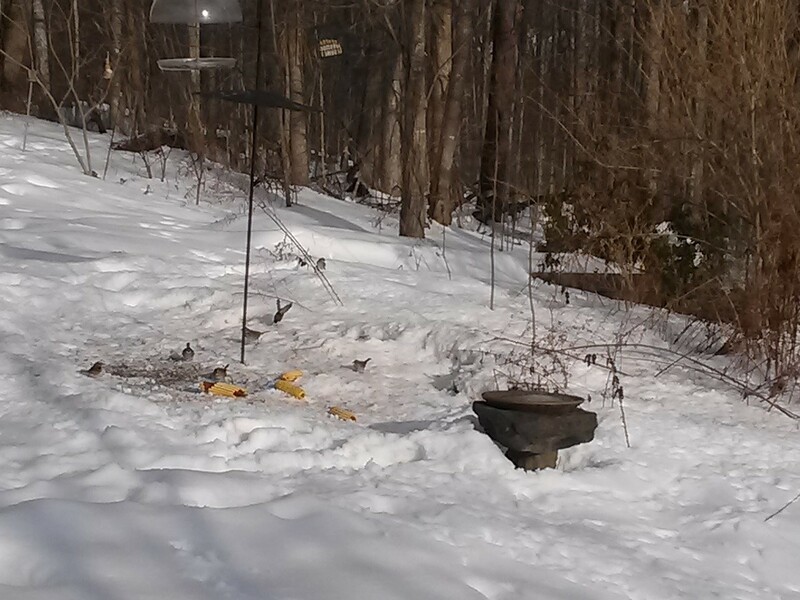 The beginning and near-end of winter 2014-15: Big Walker Creek on State Route 663 in Giles County, Virginia, on December 21, 2014 (upper photo); and sparrows around a household bird feeder in Blacksburg, Va., February 27, 2015 (lower photo). The suggestions below are from the Virginia Department of Emergency Management, “Get Ready for Winter Weather,” as of November 2015 online at http://www.vaemergency.gov/readyvirginia/winter/winter-preparedness-week,” and from Va. Gov. Terry McAuliffe’s Nov. 25, 2014, news release, “Governor McAuliffe urges Virginians to get ready for winter weather; November 30-December 6 is Winter Preparedness Week in Virginia,” 11/25/14. *Get an emergency plan worksheet at ReadyVirginia.gov. *Links to register for local emergency alerts, and more. Justin Grieser, “Winter solstice–and other interesting sun facts–explained,” Washington Post, 11/21/11, online at https://www.washingtonpost.com/blogs/capital-weather-gang/post/winter-solstice-marks-the-shortest-day-of-the-year-thursday-morning/2011/12/21/gIQANxaG9O_blog.html; and “Winter begins today: Five questions and answers about the solstice,” 12/21/14, online at https://www.washingtonpost.com/news/capital-weather-gang/wp/2014/12/21/winter-begins-today-five-questions-and-answers-about-the-solstice/. The Old Farmer’s Almanac, “First Day of Winter 2015: The Winter Solstice,” online at http://www.almanac.com/content/first-day-winter-winter-solstice. Virginia Department of Emergency Management (VDEM), “Winter Weather,” online at http://www.vaemergency.gov/readyvirginia/stayinformed/winter; and “Winter Preparedness Week,” online at http://www.vaemergency.gov/readyvirginia/winter/winter-preparedness-week. The VDEM’’s “Ready Virginia” program, online at http://www.vaemergency.gov/ReadyVirginia, is the Commonwealth’s central source of information on preparedness for all types of emergencies and disasters. Episode 190 (12-2-13), Cold Winds Return and So Does “Winter Weather Preparedness Week” in Virginia.